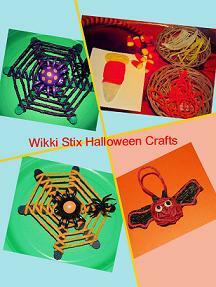 Wikki Stix Halloween Crafts for Kids! With Halloween just around the corner, the crafts below are fun creations for kids to make or give! 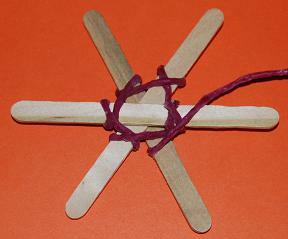 Materials needed: 3 craft sticks (per spiderweb) and 2 strands (approx. depending on the size of the craft/popsicle sticks) of Super Wikki Stix. 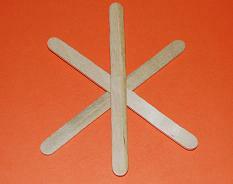 Have the children place small pieces of Wikki Stix on two of the craft sticks (see photo below). 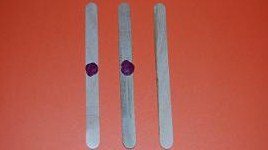 The children should then make an X with two of the craft sticks and place the third craft stick vertically between the X (see photo below). Starting near the center, have the children use one strand of Super Wikki Stix and begin wrapping behind and over one craft stick at a time. 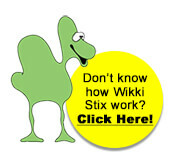 The children should continue wrapping around each craft stick with the Super Wikki Stix. When all of the center craft sticks are wrapped, move the Wikki Stix above the starting point and wrap around all of the craft sticks in the same pattern. The children should continue wrapping until they reach the top of all of the craft sticks. 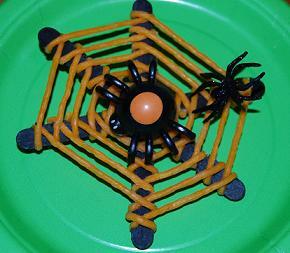 If desired, the children can add plastic spider rings or make their own spiders for the webs from black Wikki Stix. Materials needed: Orange, White, and Yellow Wikki Stix. 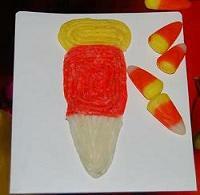 The candy corn creations are fun and simple crafts for kids. Have the children create a triangle from the white Wikki Stix, a rectangle from the orange Wikki Stix, and an oval from the yellow Wikki Stix. To assemble the candy corn craft: the white triangle should be on the bottom, the orange rectangle in the center, and the yellow oval at the top (see photo above). Extension: Invite the children to play and create by making a tray with the three colors of Wikki Stix. For very young children, make a sample craft or set out pieces of real candy corn so that they might see the color patterns. Keep the activity out during the month of October to encourage creativity and enhance fine motor skills! Materials needed: Purple, White, and Black Wikki Stix. 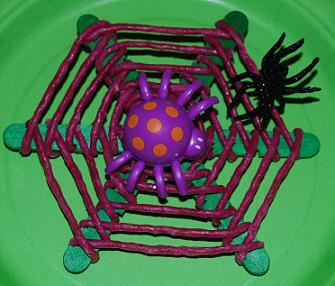 The children can create the ball for the bat’s body from the purple Wikki Stix (see photo above). The children can wrap a ball (as in a ball of yarn) or make a flat purple Wikki Stix spiral. The wings are made from the black Wikki Stix. The kids can make ovals/spirals and mold them to form the bat’s wings. The bat’s wings can then be attached to the purple “ball” bat body. 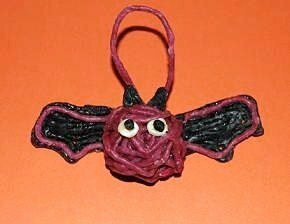 The bat’s ears are made with small black Wikki Stix triangles. If desired, the children can add eyes and a mouth to their bat crafts. The Wikki Stix bats are cute crafts for kids to make and give (or to keep as Halloween decorations). 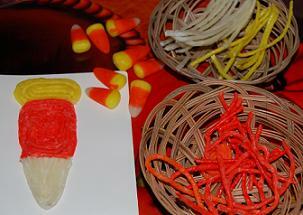 Be sure to check out the Wikki Stix Halloween treats for kids! They are a great “no-candy” alternative for home or the classroom!